“Yesterday was a tough day for me! I wasn`t recovered 100% from the Aviva Women’s Tour and the TT course was very technical: narrow & bumpy roads, full of corners, a crazy downhill & lot of wind! I had some terrifying traffic on the first kilometers, so I started pretty slow in the tailwind, up the climb I found a good pace. I took the downhill very slow to not risk anything and the last part in the tailwind I wasn`t fast, because I wasn`t able to drive smooth through all the left & right turns. But I knew that you win this race in the 2nd half, where we found a strong headwind and finally some straight roads - yay! I powered through this section and finally found the good legs. I didn`t know anything about the times, but I knew that I lost a lot of time in the downhill & corners, but also that I had a very powerful 2nd half, so I went full gas to the finish line - and yeah, I almost crashed in a traffic sign in the last corner - uh, that was close! As defending champion, I was the final finisher and I heard the announcer say “best time,” so I knew I WON! Wooow! I was very very happy because it`s the first title I am able to defend! It`s always easier to win a title than to defend it, and even though I had a bad day, I was able to defend! 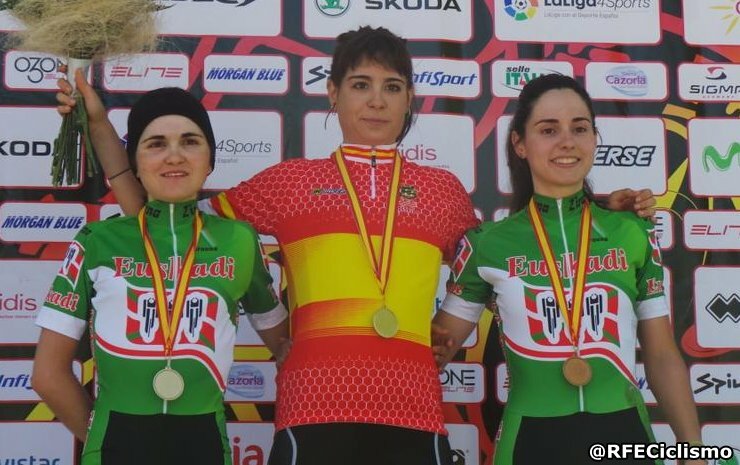 Sheyla Gutiérrez finished 4th on the podium Spanish Time Trial National Championships, just 47 seconds off the winner—to whom she placed 2nd last year—but Sheyla once again claimed the U23 jersey in her home country. Showing that her form is still strong coming off the Aviva Women’s Tour, Sheyla moved up in time from last year’s placing. While she placed 2nd in her time trial championships in 2015, Sheyla was 59 seconds back to Anna Sanchis. This year, Sheyla closed the gap to 47 seconds. As a young pro rider, Sheyla’s future looks bright!